List View is the perfect way to manage, view, and make changes to all your tasks. Simple Statuses: With simple statuses, tasks are either done or not done, and are grouped accordingly. You can drag and drop tasks by priority. Custom Statuses: With custom statuses, each status is separated into its own group. You can drag and drop tasks to change their status. When you are looking to focus on your tasks and drown out the noise from all of your teammate's tasks, simply click the "Me" tab to only see all the tasks that are assigned to you. It's important to notice that you can quickly prioritize your tasks in List View. Make a task a high priority by dragging and dropping it to the top of the status. If you have a low priority task that can wait, simply drag it to the bottom. Click the "View all" button beside "Spaces" to view tasks from every List, Project, and Space within a team. Want to view Subtasks in List View? You can view your Subtasks in List View with just one click! Simply select one or more of the colorful boxes next to your task to view a dropdown list of your subtasks, organized by status. 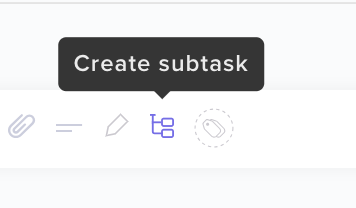 If a task does not yet have any subtasks, you can add a new subtask in List View by selecting the icon below. One of the biggest advantages of this view is that you can make changes to multiple tasks at the same time, using our multitask toolbar. Do you find yourself needing to view all tasks assigned to a specific user, or due on a certain date? Just click the Filter button to view tasks according to assignee, due date, priority, tags, and more. You can also select the status drop down menu above your task list to filter by status. List View also offers a special ability to display relevant information about your tasks in the form of columns. Select the ellipses ... above your task list to view a drop down menu. Then, click the features that you would like to be displayed as columns above your tasks. You can add or remove columns at any time by clicking on a line item in the drop down menu. Additionally, clicking on a specific column will sort your tasks accordingly. For example, if you clicked on Due Date , followed by Priority , your tasks's due date sorting would take precedence over their priority sorting. Just hover over the task and select the pencil icon! If you've pinned a cover image to your task, you can reveal this in List View! Just hover over a task's Pin icon in List View to show the image. Check out our Time View option to view and schedule tasks within your daily, weekly, and monthly agendas! Want to see even more tasks in List View? Check out our compact views!